Bangkok or to give it its full name: Krungthep mahanakhon amonratanakosin mahintara ayuthaya mahadilok, popnopharat ratchathani burirom ubonratchaniwet mahasathan amonpiman avatansathit sakkathattiya witsanukamprasit – also know as City of Angels in its shortened form, wins hands down the prize for the longest place name in the world. It also wins in the culinary department with the food as diverse as you might expect in any capital city. It’s tasty and of course spicy and you can eat in high-end restaurants or sit on plastic seats with the wok-wielding grannies who cook by the side of the street. I took a tuk tuk tour in Bangkok by night and I was especially lucky because my tour coincided with the annual vegetarian festival. Expique offer several different tuk tuk tours; and also walking and photography tours (you can read about their range here), but I was lucky because when I was in Bangkok they ran an extra special tour which coincided with the annual vegetarian festival. For 10 days each year, the Chinese community holds a vegetarian festival during which people who normally eat meat abstain. The idea is to give something back to nature and to reflect upon your lifestyle. You can buy little birds in cages in the markets or turtles or fish and release them back into the wild. Many additional markets and street stalls pop up especially for the event and many places which usually serve meat will change to veggie options only during the festival. 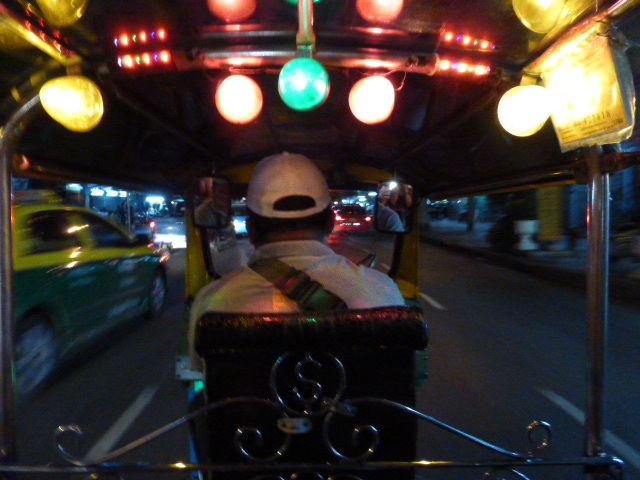 Our convoy of tuk tuks buzzed around the bright neon-lit city streets with stops at a large Chinese temple where people were going all out with their celebrations, and the night time flower market, the Giant Swing and Wat Pho. 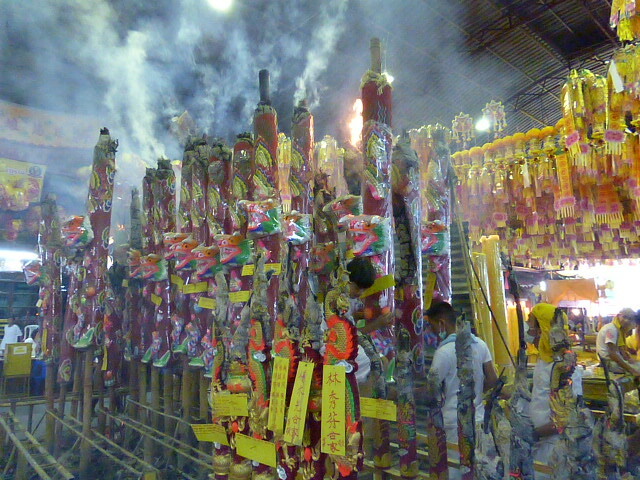 At the temple festivities were in full swing and the air was filled with the sweet cloying smoke from giant incense sticks which gangs of men were hauling into position. These sticks were more like tree trunks and stood over 8 foot high. Drums, cymbols and chanting echoed around the giant hangar and everywhere were people with little carts cooking and serving all kinds of (veggie) delicacies. There was a riot of Chinese red and gold and over on one side of the hall a side temple had been constructed and a religious ceremony was taking place and on a stage on another, some sort of musical play was being performed. It was a peek into another world with organised chaos and all types of food that I had never seen before. 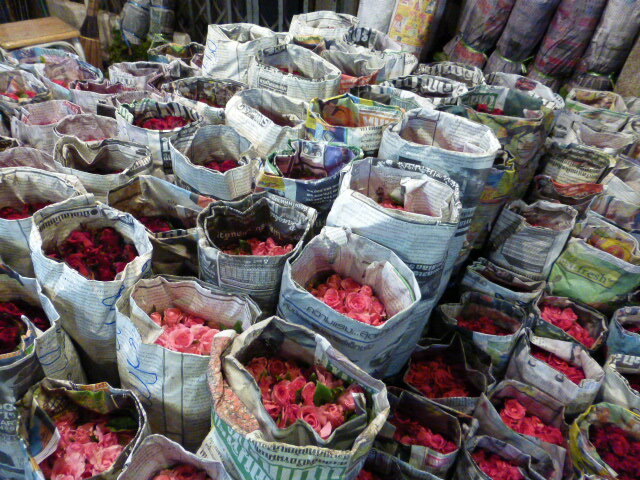 The night time flower market is a surreal place with the peak time for sales being at around 2am and maybe because of the darkness the scents were potent and more concentrated than normal. Ladies were sitting behind long wooden benches and stringing golden chrysanthemum blooms into garlands, massive bags of white waxy petals like giant pillows were ready to be strewn as confetti and armfuls of roses stood to attention, held upright by their wet newspaper collars in readiness for the rush that would come after midnight. Our tuk tuk drivers nimbly negotiated the crush of cars and took us to the Giant Swing which marks the centre point of the city. Constructed in 1784 the renovated swinging part was removed in 1935 for safety reasons. The custom or game used to consist of lying on the swing high up in the air and removing a sweet or a biscuit from a bamboo spike while swinging past….with one’s teeth. It’s hardly surprising that this practice was outlawed following several fatal accidents – so nowadays the citizens of Bangkok find their kicks by riding their scooters on the wrong side of the road into oncoming traffic. We took another food break and stopped in a little backstreet cafe where we were served from their special vegetarian menu, all crammed into a sticky hot space fired by gas burners and some more of those wok wielding grandmothers. 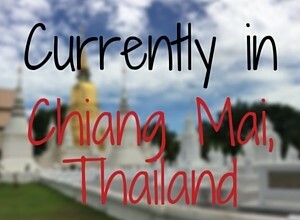 Our final stop of the evening was a surprise when we went to Wat Pho which is home to the Reclining Buddha. I has been there just the previous day courtesy of my Highlights of Bangkok tour that had been arranged through TBEX (the Travel Bloggers Conference) and the Tourism Authority of Thailand. Then we had battled with the hordes of tourists and the searing temperatures but now at night we had the complex virtually to ourselves and it was magical. The buddhas with their gold-leaf decorations and the mosaics on the chedis and wats sparkled under the floodlights and there was a powerful hush about the place. 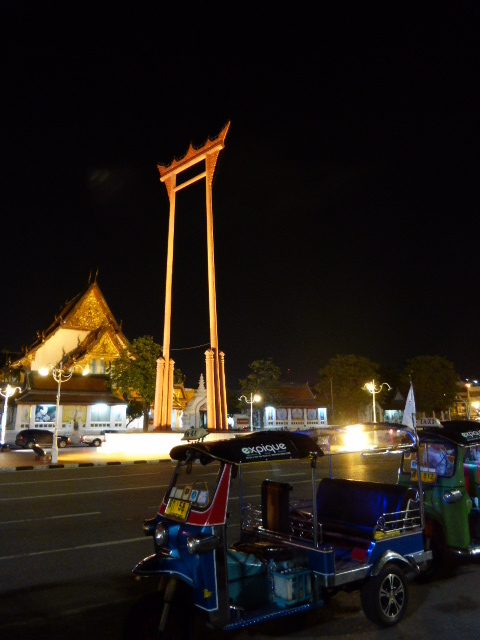 Few tourists realise that the complex is open at night and the Thais wouldn’t normally visit after dark. Expique offer a range of scheduled and private tours and experiences. Our Bangkok day tours include walking tours, photography tours, cultural and culinary experiences, and of course the tuk tuk tours. I enjoyed the tuk tuk tour courtesy of Expique when I attended TBEX in association with the Tourism Authority of Thailand, although this has not influenced my opinion in any way. 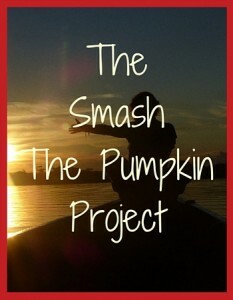 Wonderful post and beautiful photos! That name is crazy long and unpronounceable for us unsophisticated Westerners. I did a tuk tuk tour in Lisbon, after five hours with my guide my tailbone was sore from being jostled over hills and cobbles! Thanks for the post Jane. We always love reading reviews of our tours at Expique, especially our special one off tours. Look forward to hosting you again. Thank you for the opportunity Simon. I wish that swing was still in use! I would totally be having a go on that thing hehe! 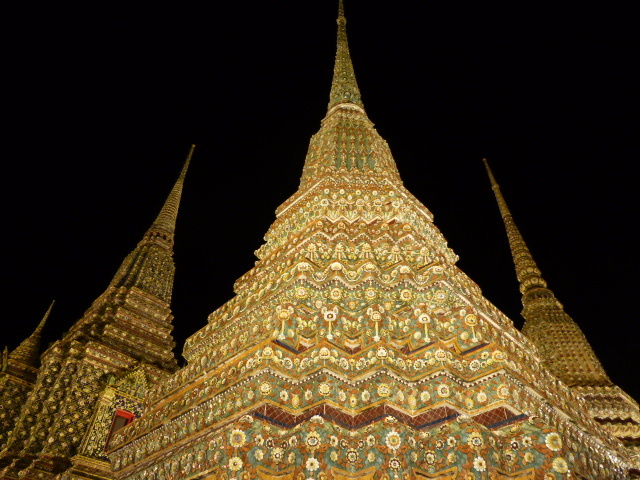 So good to see you visited Wat Pho at night. It’s an absolutely stunning spot and it’s free to get in at that time woohoo! It was a bit high for me!